It's a Wonderful Life, Frank Capra's 1945 fantasy film, may not have been a box office smash, but it is one of the most critically acclaimed films ever made, and a holiday classic. The film's thematic message about the value of community building over personal ego gratification may have seemed a little out of fashion during the reign of the "Me Generation," but it is just as timely today as when the film was released. At any rate, It's a Wonderful Life is a great story with a lot of emotional impact. So let's look at how the structure of the story creates this impact, using Dramatica as an analytic tool. 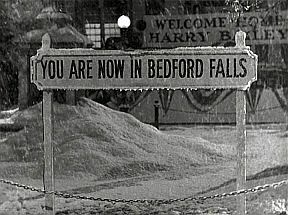 It's a Wonderful Life takes place one evening in the small town of Bedford Falls. A financial crisis erupts at the local, family-run Building & Loan where $8,000 goes missing just as the bank examiner arrives to check the books. The Building & Loan's Executive Secretary, George Bailey, is totally innocent of wrongdoing. Nonetheless, the crisis could be the end of his career and his family's business. He may even go to jail. Worse, this crisis is really the last straw for George, whose life has been filled with frustration and disappointment. To avoid what seems like the worst possible fate, he considers throwing himself off a bridge. The Overall Throughline, which concerns the majority of characters in the story world and the pursuit of the story goal. The Main Character Throughline, which concerns the Main Character's inner conflict. The Impact Character Throughline, which concerns the impact character's influence on the main character. The Relationship Throughline, which concerns the evolving relationship between the main and impact characters. Each of these throughlines operates in a different domain (either Situation, Activity, Fixed Attitude, or Manipulation). Each has its own concern, theme, problem, etc. As I mentioned above, the story goal in It's a Wonderful Life is to prevent George Bailey's suicide -- to stop him from throwing away his future. This goal is shared by most characters in the story world, including his wife, Mary, his children, his guardian angel, Clarence, and George's many friends and relatives. The entire community comes to his aid at the end of the film by donating money (to make up for the missing $8,000). At the same time, George isn't the only character in the film whose future comes into jeopardy. In flashback, we learn about Mr. Gower, a pharmacist George worked for as a boy. In a moment of drunkenness and grief over the death of his son, Mr. Gower almost poisons a child by putting the wrong substance into some pills. Fortunately, George notices the mistake and stops him. George also saves his little brother when he accidentally falls through the ice on a frozen pond -- an event which could have cut his future short. Most importantly, during a run on the banks, many investors in the Building & Loan nearly make the mistake of selling their shares for half their value. George saves their investment with a combination of talk and donating some money of his own. In other words, most of the characters in the story world experience crises which threaten their futures. And in each case, it takes someone else's help to get them through the crisis, to prevent them from making the wrong choice out of panic. In Dramatica terms, we can say the Overall throughline falls into the Domain of Situation. It has a Problem of losing Control, and the solution is Uncontrolled (that is, for the characters to surrender control and let someone else save them). George Bailey is a man possessed of great ambition. Even as a boy, George dreams of leaving Bedford Falls, becoming an architect, seeing the world and generally having a more exciting life. He works out detailed plans to make these dreams happen (Problem of Logic). However, every time George has a chance to begin the life of his dreams, a crisis arises and George feels compelled to postpone his plans to help others. As a result, he feels increasingly like a failure. 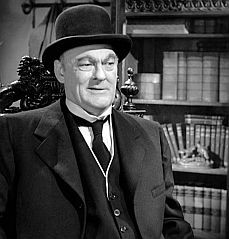 In contrast to George's drive to Help, the antagonist of the story, Henry F. Potter, has a Crucial Character Element of Hinder. Potter is a wealthy man, intent on increasing his wealth at the expense of everyone else in the town. He specializes in renting substandard homes for outrageous prices, and generally making it difficult for working people to fulfill the American Dream and enjoy a wonderful life of their own. Fortunately, Potter does not have complete control over the housing market (Problem of Control). As long as the Building & Loan remains independent of him, people have a path to affordable home ownership and a middle-class life. As impact character, Potter is the one person who actually encourages George to pursue his ambitions and give up his need to help others. Potter is an embodiment of the "me first" attitude. However it is not an example that is at all appealing, since Potter has no friends or family and is universally hated. With a Concern of Obtaining as much power and wealth as possible, the impact character throughline falls into the Domain of Activity, and certainly Potter is viewed mainly through his unceasing activities to eliminate the Building & Loan as a threat to his goals. Throughout It's a Wonderful Life, the relationship between George and Potter evolves as George's influence on the community of Bedford Falls grows and Potter's diminishes. By default, the relationship throughline must be in the one remaining domain, Fixed Attitude, and this indeed seems to be the case. George and Potter have fixed but opposite attitudes towards lower income people. George believes they deserve to have a decent, if not a wonderful life, while Potter does not. More specifically, Dramatica says that each throughline has its own four-stage arc (for a total of 16 signposts). The Dramatica software goes a step further by assigning recommended themes for the signposts of each domain, the order of which may be different for each story. So let's look at how the throughlines progress in It's a Wonderful Life, starting with the Overall Throughline. The progression of the overall throughline is best described using the W-plot. Each signpost represents an act, and each act begins and ends with a major turning point or driver. With George contemplating suicide, his friends and relatives pray that he receives help. Hearing the prayers, the angels assign Clarence to act as George's guardian angel and have him begin a review of George's past so he can discover how to help him. (From here on, much of the story is told in flashback.) Clarence learns of George's early ambitions and his drive to help others. George's father, Peter Bailey, dies of a stroke the year George's brother Harry graduates from high school. George had spent several years after high school saving money so he could take a trip to Europe and then start college. Instead, he settles his father's affairs and assumes his father's role as Executive Secretary of the Building & Loan. He sends his brother, Harry, to college instead. On the day of George's wedding to Mary Hatch, a run on the banks threatens to bankrupt the Building & Loan. George saves the Building & Loan by donating his honeymoon cash to the business and convincing investors not to sell in a panic. His actions protect the future of many of the town's inhabitants. George faces a crisis when his partner, his Uncle Billy, accidentally loses $8,000 of the Building & Loan's money, (it falls into Potter's hands) and Potter arranges to have George arrested for embezzling. Clarence transports George to a version of the present in which George has never been born -- one in which the entire town of Bedford Falls is worse off -- so George can see that, despite his frustrations, he is actually leading a wonderful life. Everyone in the community who is grateful for the contribution George made to their lives donates money to make up for the missing $8,000. "I know what I'm going to do tomorrow and the next day and the next year and the year after that. I'm shaking the dust of this crummy little town off my feet and I'm going to see the world. Italy, Greece, the Parthenon, the Colosseum. Then I'm coming back here and go to college and see what they know... and then I'm going to build things. I'm gonna build air fields. I'm gonna build skyscrapers a hundred stories high. I'm gonna build bridges a mile long..."
What he doesn't realize is that another plan is hatching -- Mary's plan to marry George and live in an old house in Bedford Falls. After Harry introduces the family to his new wife, George realizes, despite all his plans to the contrary, that he is really in love with Mary. She is the real passion in his life. So he asks her to marry him, following his heart rather than his head. In the final act, George gives up his frustration over not achieving his dreams and realizes that he has been living a wonderful life all along. He stops hating the town of Bedford Falls and expresses his love for it and all its inhabitants. George first sees Potter during an argument between Potter and George's father, Peter Bailey. Peter is asking Potter for a loan on behalf of the Building & Loan and Potter is resistant. Peter cannot understand why Potter is so stingy, since he has no family to spend his money on. However, to Potter, money is everything. Later, Peter gives George a valuable appraisal of Potter's character. 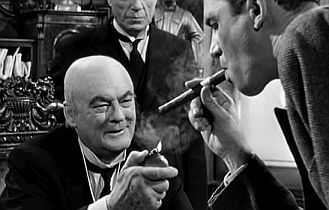 George notices Potter taking advantage of the financial crisis to gain control of the bank and other institutions in the town for cheap. Potter saves most of the town, enriching himself in the process. Potter takes advantage of Uncle Billy's forgetfulness to obtain $8,000 of the Building & Loan's money, intentionally creating a crisis that he hopes will cause the business to collapse. When George asks Potter for a loan (echoing his father's request from years ago), Potter grills George on his financial assets, using this information to gloat and belittle George. Relationship "White Moment" in "It's a Wonderful Life"
The relationship is established when George (only a boy at the time) interrupts the argument between his father, Peter Bailey, and Potter. Potter considers Peter a failure because he is not wealthy and must beg for a business loan. George, however, defends his father, saying he is the "biggest man in town," bigger than Potter, because he helps people. George is sent out of the room for his outburst. In act 2, the relationship deepens as George, now grown up, can hold his own against Potter. George and Potter argue over the memory of Peter Bailey. While they both agree that Peter was no businessman, Potter claims that by helping working people buy homes through the Building & Loan, Peter was doing them a disservice, making them "A discontented, lazy rabble instead of a thrifty working class." George disagrees, saying that the Building & Loan helps make people "better citizens, better customers." Moreover, George argues for his father's belief that there is a moral imperative to helping working people live in decent homes. Typically, in a relationship that is broken by the end of the story, the third act presents a "white moment," a crisis in which the relationship reaches its peak. 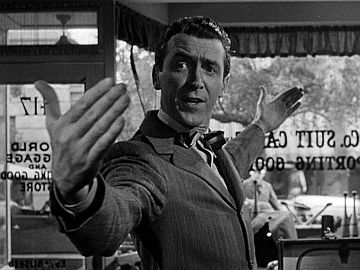 In It's a Wonderful Life, this occurs when Potter offers George a job. Potter's motive is to get George out of the Building & Loan so it can collapse and stop cutting into Potter's rental business. Potter offers George everything he ever wanted -- a big salary, the chance to travel, and all the ego gratification he always longed for. George almost accepts, but at the last second his conscience makes him reject the offer. At their final meeting in Act 4, George begs Potter for a loan to cover the missing $8,000 and save the Building & Loan and his career. Potter refuses and, following his worst instincts, decides to swear out a warrant for George's arrest instead. In a panic, George runs out. Arranging those 16 signposts in the correct order (all the Signpost 1s in Act 1, the Signpost 2s in Act 2, etc.) would give you a good outline of the entire story. However, for those interested in how the 8 Basic Plot Elements, as described in the article "How to Create a Plot Outline in 8 Easy Steps," work in It's a Wonderful Life, I'll summarize them as well. You'll notice that Dramatica assigns them labels similar to many of the signposts. The goal is to safeguard the futures of George Bailey and the community of Bedford Falls. The danger is that George's failure to fulfill his personal ambitions will cause him to commit suicide and curtail the dreams of everyone he would otherwise help. Clarence must review George's past to discover how to help him in his present crisis. George's plans for his life (travel, college, becoming an architect) both threaten the community (if they succeed) and are a danger to George if they fail. George often passes up opportunities that would benefit him financially. He rejects job offers from his friend Sam Wainwright as well as Potter. He ignores Sam's recommendation to invest in the Wainwright company. He donates his own money to the Building & Loan. While George becomes a family man and a pillar in the community, Bedford Falls changes from a community of slums to one of middle-class suburbia. The crisis could be solved much more easily if Uncle Billy could remember what he did with the missing $8,000. Unfortunately, his memory is chronically poor. 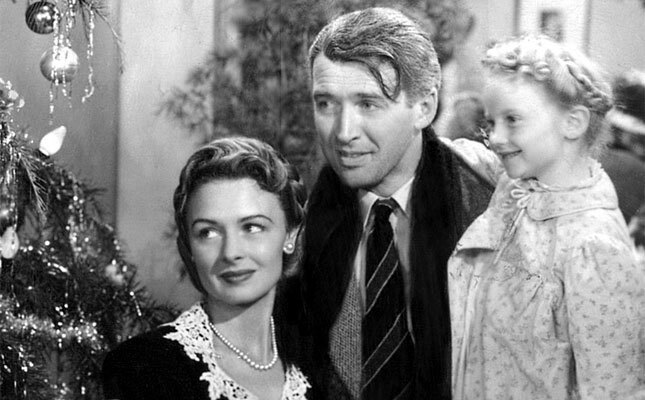 The Outcome of It's a Wonderful Life is Success, since the future of the community, the Building & Loan, and George is saved by everyone's financial contributions. Harry declares George, "The richest man in town." Clarence's final message to George is that "no man is a failure who has friends," and George is certainly surrounded by friends in the final scene. Thus, George's story ends with a Judgment of Good, proving he resolved his personal crisis successfully. Obviously, Frank Capra and his team did not rely on Dramatica to write the script for It's a Wonderful Life. But the amazing thing about Dramatica theory and the accompanying software is how well it predicts the structure of great stories. For a writer, Dramatica can provide a shortcut to developing a great plot by suggesting ways to fill in the missing gaps in a work-in-progress. Incidentally, if you would like to read the complete script for It's a Wonderful Life, it is available online for free at the Internet Movie Script Database.